DC COMICS CELEBRATED ITS 50th ANNIVERSARY by blowing itself up. For many comic fans and creators, it had to be done. Years of accumulated history were beginning to slow down DC's mightiest champions, and the "parallel worlds" theory that allowed superheroes from the 1940s and the 1980s to co-exist was starting to interfere with the ideas of a new generation of comic writers, who wanted the freedom to re-interpret their childhood heroes. And given the success that revitalized heroes such as Marvel's Daredevil and Uncanny X-Men were enjoying (not to mention DC's own New Teen Titans and Swamp Thing), it's easy to see how DC was anxious not to let its biggest cash cows fall too far behind the rest of the herd. 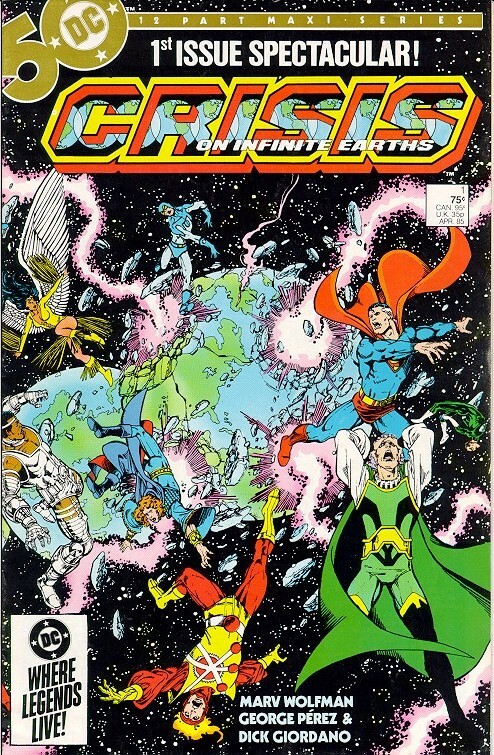 Crisis on Infinite Earths was the company's answer to its own creative crisis. The sweeping 12-issue series included just about every hero and villain ever published by DC, saw trillions of lives snuffed out and even dared to picture the deaths of two of DC's most beloved characters. Simply put, Crisis was a message from the comics industry to the world: Assume nothing. The story itself is nothing less than awe-inspiring. The millions of universes in DC's "multiverse" are slowly fading out of existence in order to feed the Anti-Monitor's insatiable need for power. The Monitor, his benevolent opposite in our universe, moves quickly to mobilize the superbeings for battle, but only the death of the Flash secures the safety of the five remaining universes. Eventually, those five are saved by the actions of the near-omnipotent Spectre, who restarts time from the beginning to save Creation itself. 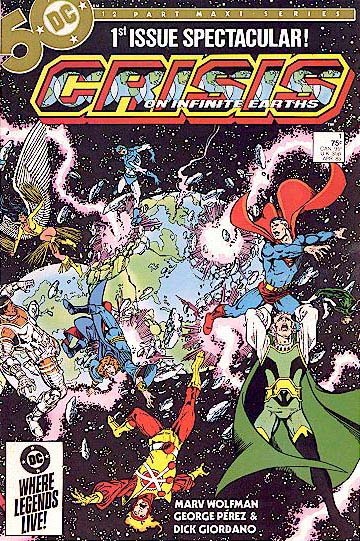 The series ends with only one universe in existence, an amalgam of the five that survived the Anti-Monitor's onslaught. The heroes that survive are given new histories, and other heroes and villains considered redundant or unnecessary are simply erased from existence. The impact of the series on the entire industry cannot be overestimated. Any discussion of DC's history will now and forevermore have to make reference to the "pre-Crisis" or the "post-Crisis" universes. Never before had any comic publisher swept away 50 years of history to restart the universe, and it's unlikely fans will ever see it again. 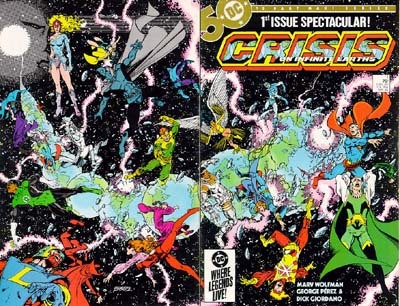 Crisis introduced a new level of sophistication into the comic-book world. Not only was it the starting point for the re-introduction of every major DC character, it also marked the beginning of a universe in which major heroes died and stayed dead, millions of lives could be snuffed out on a whim, and a hero's life could be dramatically changed without warning. The slate was wiped clean by the actions in Crisis, and a new generation of DC writers and artists were eager to make their own mark upon it. Crisis also caught the attention of the mainstream media, who for the most part saw comics as juvenile entertainment. Columnists in national magazines looked at what the series represented, and for the most part they saw a loss of innocence, a sad funeral for the heroes who gave so much for their world. Maybe so, but Crisis could also be seen as something a little more uplifting. It was proof that even a large comic company could change with the times, and that it wasn't afraid to shake things up. Mourn all you want for the lost heroes, but Crisis will always serve as the prime example of how far a comic company will go to keep its characters fresh and its purpose clear. With Crisis rewriting everyone's history and erasing some heroes from existence, writers were kept busy for years rewriting the histories of DC's heroes. For example, in the post-Crisis universe, there was no Superboy, a fact that complicated the Legion of Super-Heroes' origin story, since they originally formed their club to honour his memory. Artist George Perez proved to be an inspired choice for the series. He reveled in drawing intricate scenes filled with dozens of characters; when writer Marv Wolfman requested a cover with three villains on it, Perez gave him 60. DC used the mini-series to introduce the heroes it inherited from the defunct Charlton Comics lineup. The Blue Beetle, Captain Atom, the Peacemaker, and the Question went on to become integral parts of the post-Crisis universe. The title of the series came from the first Justice League of America series, which for years hosted an annual team-up story involving Earth-1's Justice League and Earth-2's Justice Society. These stories were inevitably titled "Crisis on Earth-1/2/3/X/etc."